My last few articles have been on the healthy side (Fellowship Foods, Sproutz…) so I figure we could all use a little palate cleanser with a donut throwdown! The mission that I have chosen to accept is to find Beaver County’s best donut. I went into this mission comparing only three donut shops, because those are the three that are most well known in the county – Oram’s, Mac’s, and DeAngelis. With a combined total of 202 years of donut making between the three of them, you can pretty much guarantee you’ll get a good bite at any of them. But… you know, just to keep things interesting around here, I’d like to see which is the best. Here’s how I decided to do it. I wanted to make things even and get the same donuts at each shop. Unfortunately for me, I went out too late and this ended up being more difficult than it probably would have been had I been donut hunting at 8 am. Anyway, I somehow managed to pull through and come up with a comparable plan. 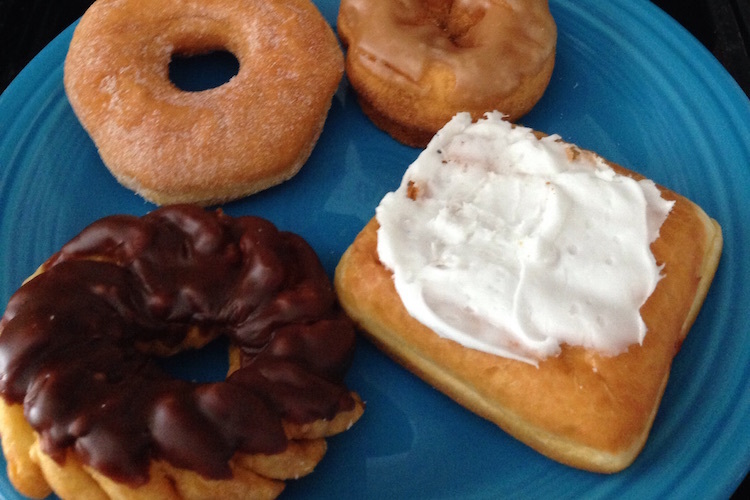 We have four donuts to compare – A sugar or glazed, a cake, a filled, and a specialty donut. The categories of the judging are flavor, appearance, texture, size and overall…AKA the FATSO scale. The judges will be myself (duh), the Mister, Teenager Beaverhausen and Toddler Beaverhausen. First up, the sugar / glazed. These are my personal favorite type of donut. I love how they are soft and airy. Feels like you could eat a whole dozen yourself!! But seriously, they’re the best. 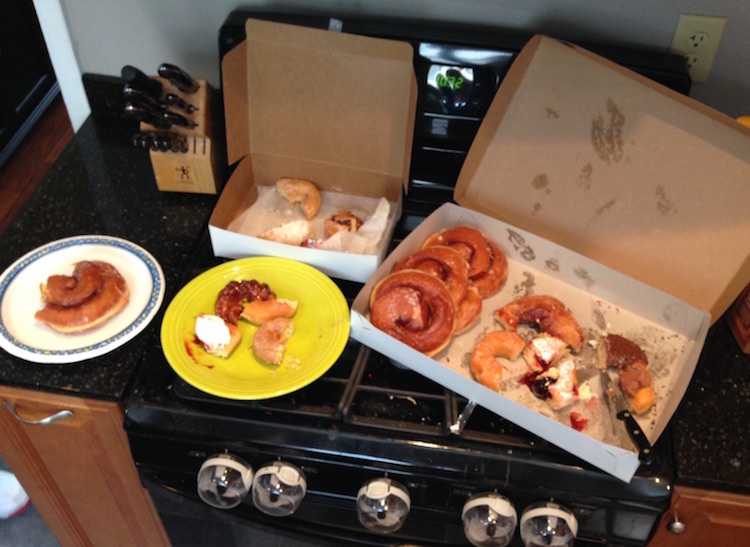 We had glazed from Mac’s and Oram’s and a sugar from DeAngelis. Next up, cake donut. Toddler Beaverhausen is a huge fan of these, especially with sprinkles. Although, as you will notice, he isn’t really picky about donuts. Mac’s was iced with sprinkles, DeAngelis had maple icing and Oram’s was iced with sprinkles too, but the icing actually filled in the donut hole. More icing = more awesome. Third are the filled. All three were raspberry jelly filled. DeAngelis was square with icing, while Mac’s and Oram’s were both round and had powdered sugar. YUM! Teenager and I agreed on Mac’s here, Mister went with Oram’s, and Toddler… I think you can guess. He picked all of them. Last, the specialty donut. This was a little more difficult to compare because they were all so different. From Mac’s, we had an apple fritter, DeAngelis was a French donut with chocolate icing, and Oram’s, well, I think you know what we had from Oram’s…the massive ‘big as your head’ cinnamon roll. The Mister said the Oram’s was too big (What?!? Who brought that guy to this donut party?!) and he went with the French donut from DeAngelis. I liked the Mac’s fritter, and Teenager liked Oram’s. The toddler wasn’t really any help, but we let him continue to taste them. By this point, he was just jumping up and down. I’d also like to throw in a quick honorable mention! Before our YBC team dinner at The Palms this week, Alison suggested I try the donuts from the Aliquippa Farmer’s Market. She happened to be heading that way so I asked her to pick one up for me. They literally only had one left! It was a cakey donut with sugar… and it was awesome! I wish I had more of those, or at least had remembered to snap a picture before “tasting” the entire thing! This lovely donut came from Betty Starn of Betty’s Bake Goods. She attends the Aliquippa Farmer’s Market on Wednesdays from 4 pm – 7 pm. Check her out!!! So, while this was such a difficult task to taste and rate these delicious treats (wink wink), Family Beaverhausen went for it and ended up a family divided! 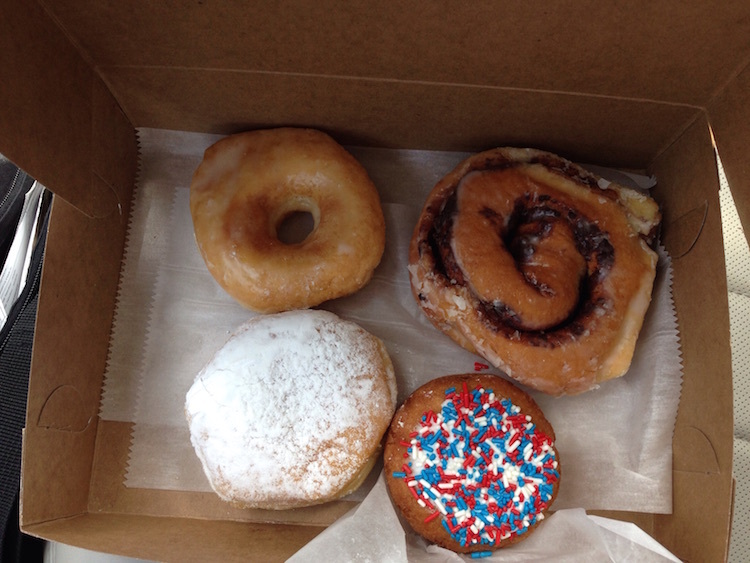 Teenager took Oram’s, Mister went with DeAngelis, I went with Mac’s and Toddler just votes for having more donuts. I decided to reach out to my fellow YBC writers to see what they had to say. There has to be a clear cut winner, right?? So. No winner, even using the uber-scientific FATSO scale. Hmph…. What do you guys think?? 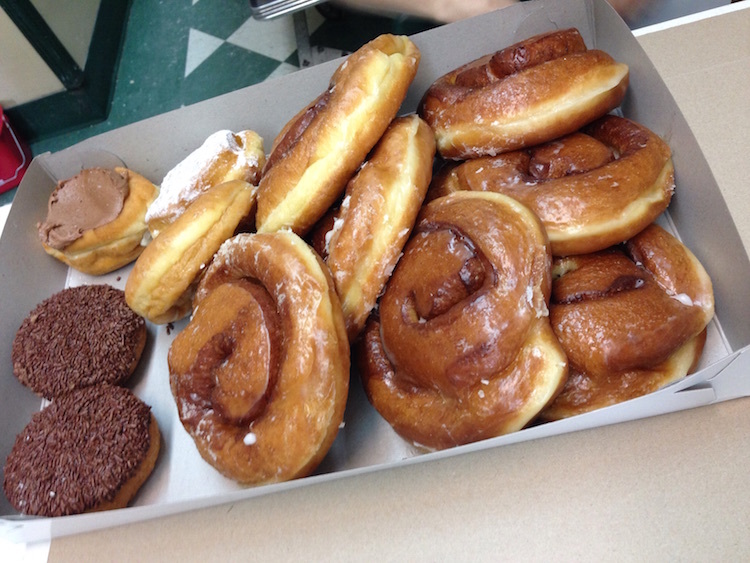 What is your favorite donut spot? I am not above repeating this challenge with a few more shops. 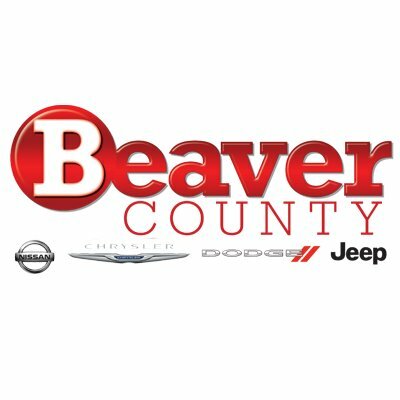 What I won’t do for Your Beaver County! Anastasia Beaverhausen is a married, stay-at-home mom of three kids. She was born, raised and still lives in downtown Beaver. Her main goals in life are making sure everyone lives through the week, the house doesn’t end up condemned, and teaching two (so far) small people how to “people” properly. In her free time, Ana enjoys running, knitting and gardening, although free time is a pretty tough thing to come by these days. Follow her on twiter @bcBeaverhausen! 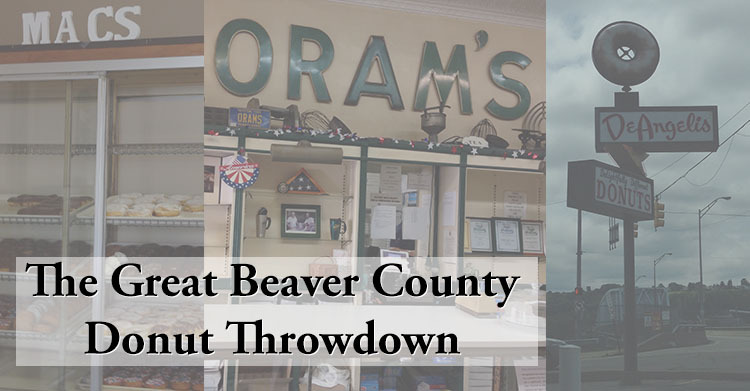  Archived in Best of Beaver County, Food, Stories, Toss-Up and tagged archive, dining, donuts, throwdown.